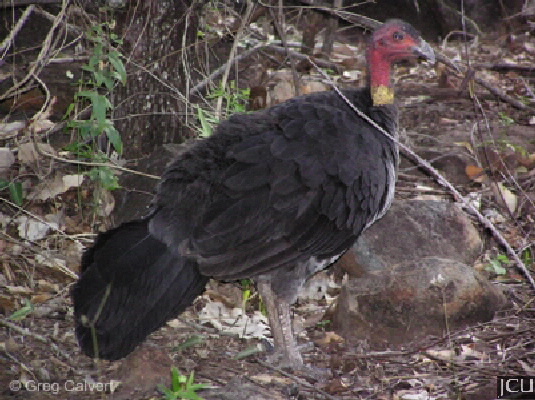 This large bird to 65 cm long is often found associated with the creek between the Union and Nursing Sciences in Townsville, scratching in the litter as well as along Half Moon Creek in Cairns. Both sexes have a red head devoid of feathers but the male has a large yellow wattle. They are readily distinguished by the vertical fan-shaped tail. The male builds a large mound in which the eggs are laid and incubated. Legs and feet brown, eyes yellow, bill black.